This is the second article in a series on maternity. See also The Hidden Face of Love. They are everywhere, unknown. Countless women whose maternal nature is unobserved, whose love is hidden in treasure houses as one hides jewels in war — precious wealth, stored away stealthily in the dark night of sorrow; hope of better days perhaps sustaining. One in three pregnancies ends before most people ever know of it. Some statistics say one in four, if we consider, as we should, those conceptions that never fully implant. While it is difficult to find precise figures, in the United States alone, this means roughly one million in 4.4 million known pregnancies annually. The silence surrounding the early weeks and months of pregnancy is a modern and culturally intriguing phenomenon. Most women I know will not share the news they are pregnant until after three months have passed and the ‘pregnancy is safe,’ mostly because they fear they then have to also offer the bad news, should the worst come to pass: they ‘miscarry’. But is this cultural silence helpful? And is it causing an epidemic of hidden maternity? Let us backtrack for a moment. First, almost as an aside, albeit a critical one, I would like to propose that the term ‘miscarriage’ is a misnomer for what actually takes place. As in a live birth, a woman goes into labor to ‘miscarry’. Depending on the stage of early pregnancy, there are obvious signs of another life that cannot be denied. There are labor pains. One does not ‘carry’ a pregnancy, and the somehow ‘mis’carries it. No, a woman is either pregnant or no longer pregnant. The life within her is either alive, or it is not. So ‘miscarriage’ is a cultural term, not a medical term, and it does women more harm than good. It fails to give women closure as to what is really unfolding; it leads them to self-blame for whatever they may post-facto identify as having gone wrong; it confuses women into thinking that whatever happens ‘medically’ or ‘in nature’ is part of a self-selecting process from which they are, or should try to detach themselves, because after all there is simply ‘pregnancy material’ that was not viable. In this we violate and deceive ourselves; we will always fail to be convinced, and so remain ever un-consoled. Dualism, materialism, and separation have no strength against the real reciprocal unity of being that is a pregnancy. Something violently tragic takes place when we can no longer sustain a life within us. We do not simply cease to ‘carry’ ‘it’; we lose our very own life blood in such loss. An integral part of us, no longer lives. The cultural language on this must change, as what actually happens is not ‘miscarriage’, but child loss. And then there is the grief. No woman who knows she is pregnant and then loses the baby really thinks that this is simply another ‘medical event’ if she really thinks through it. The majority of women are led to believe this; paradoxically perhaps, they are led to disbelieve themselves. Culturally, we also collectively believe that pregnancy loss is simply a medical event we need to ‘get through’. The unfortunate side effect (or cause) of such a misguided cultural perception is a dualist understanding of pregnancy, which, I dare say is the foundation of so many of the divisive debates on reproductive rights issues that we face today. It is convenient, some would even dare say charitable, to try to mask the reality of what actually takes place in pregnancy loss; it is convenient to detach ourselves from this reality, and further, we are socially expected to conceal our grief. The price is a splitting of what is integral; an intentional severance that does not hold in the test of truth and further weakens. The result is that thousands of women are left to grieve in hiding. We live in a time of widely unobserved (maternal) grief, the effects of which are unbearable; inhumane really. Love will not be contained (for so long). Its nature is to break forth: it is outward and other bound. The question then, is why can we not deal with the truth about death in pregnancy? Or is it that this very modern society finds it too troubling, too inconvenient, too unpleasant, to help women love as they do? Is there too much at stake? Grief is a natural, maternal response of love towards a real living child whose life ends too early in pregnancy loss. There is no way around this reality, whether it takes place pre-implantation when already a woman’s body signals drastic change, at eight weeks, or sixteen, or ever later. The life is no less or more living, and the tragedy is always the same, always as real. Friends, family, medical professionals, clergy, thought leaders, might do well not to sugarcoat the tragic in euphemisms. It would actually help women to know the harsh truth: their love would blossom and their pain is eased. Grief is natural to love in death. We would not grieve if we did not love. In any death, we grieve perhaps not so much for the person who has died, who can no longer physically receive this form of our affection, but for ourselves, because a severance has taken place: that alienation, that separation of loves. In any pregnancy loss, a mother’s love is not just any love, observed as love is, in the mutual reciprocity and myriad of possible human exchanges. It is a hidden love. It is a love directed at a being no one has ‘known’, no one else has been brought to love, no one has seen, no one has named; one she is intimately bound to, she sustains in being. It is this maternal love that is wrenched by separation: a separation that takes place in a viscerally physical way, a separation that cannot be undone, ‘moved on from’, replaced with ‘another baby we might have’; forgotten. If infertility or other reproductive illness is part of the picture, as it often is, the agony is multiplied and left further unobserved. The losses here are vast: there is the loss of the child’s life; the lost opportunity of love that others could have expressed for the child had they known; the loss of joy in the news of a perhaps long awaited pregnancy; the critical loss of bonding that a spouse will not be able to summon for a child they did not know was living — which is critical absent support to the mother; the lost possibility of that shared, sustaining solidarity of grief which is the privilege of true friendships. All of this, and more, is the great and sad price of silence. Hidden maternity is a feminist issue, it is a women’s rights issue, it is a socio-cultural phenomenon; it is a medical, psychological and maternal health issue, as certainly we must do everything in our power to identify, prevent and treat the many possible causes of (early) pregnancy loss. But on a far more fundamental level, hidden maternity is a matter of justice and decency, and is related to virtue in public modern society: it is inextricably linked to the common good — to the well-being of people in community, whose primary obligation is the particular care of the other, however hidden, for the welfare and flourishing of many. I am a hidden mother. I have a daughter no one has ever met, whose name few know. I was encouraged to name her by some good souls who acknowledged her life, in the hiddenness of so private a tragedy, and so honored her before my own heart could manage the strength. It was this virtuous and courageous love, offered to me as her mother, that enabled me to give her the gift every child receives at birth: the gift of a name — an identity to match the wonder of her dignity and personhood at so invisible a time of her life and so tender an age. And if there is one consolation in this hidden maternity, it is the joy of knowing her so truly, and never forgetting—of sharing her hidden life, of which little, and yet surprisingly much can be said. I waited ten years for this joy. I knew I had become a mother only as I lost her. Maria Caterina is our first child. So the next time you encounter the cultural perception that pregnancy ought be hidden until it is ‘safe’ to tell, or that women simply ‘miscarry’ and ‘ move on’, and that is how things go, have the courage, the generosity, to offer a response that speaks to the hidden maternity of the woman before you. Tell her it is good to tell of the joy she sustains within her, now. In doing so she offers everyone she tells a share in her own fulfillment and fruitfulness, her own hidden maternity; she participates actively in the most basic expression of the common good and tells the world what it so longs to know — that the life of another, always life, even in death, is a wonder, a gift; that our personal fulfillment is dependent on the (still hidden) community of persons (she intimately knows and loves) with whom and for whom we exist in society. And should death come, tragically, too early, encourage her to grieve the vastness of her loss. She will then not only have the support she needs in sorrow, but also the knowledge that the hidden life she sustained for a time still multiplies a privileged hidden maternal joy, and further strengthens the fabric of a modern social order. For this is what life does. It rejoices in love offered and received; it is a good stronger even than the physical finality of death itself; it is fruitful — life-giving by its nature. Imagine the millions of hidden mothers. And imagine the beauty of their children, no longer living, yet in memory honored. It is good time to reveal hidden maternity — for women’s sake — and to the modern (feminist) culture we live in. Let the treasure houses be disclosed and unlocked to reveal hidden bounty. The cultural paradigm of deafening silence ought to give way to the symphony of the truth of such vastly fruitful maternal love, however yet un-observed. There is a lot at stake — the primordial goods of truth, and life, and love, in fact. The common good depends on this. And the culture thirsts for so much more. 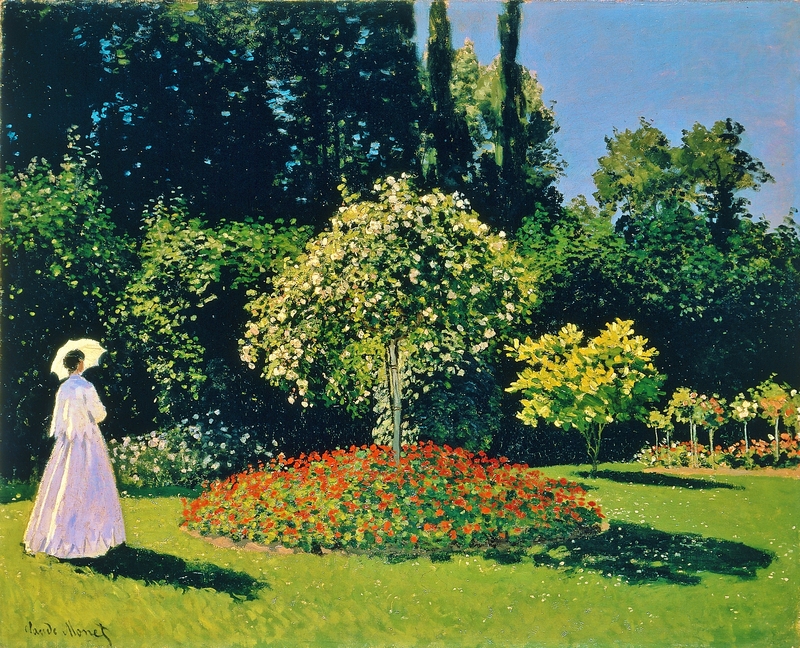 Image: On 28 January 1857, Oscar-Claude Monet’s mother, Louise-Justine, died when Monet was sixteen. He then left school and went to live with his widowed childless aunt, Marie-Jeanne Lecadre, who ensured he continued his artistic education. Marie-Jeanne Lecadre is the subject of his work ‘Femme au Jardin’, and one of the many hidden mothers depicted in the history of art.